& he must join politics, even mute people get success there… 🙂 Great Doodle…!!! Ha ha ha. That’s unfortunately true. Oh one talent is not enough anymore! Sad state of affairs. 🙂 indeed acting is mandatory ! Very nicely presented. 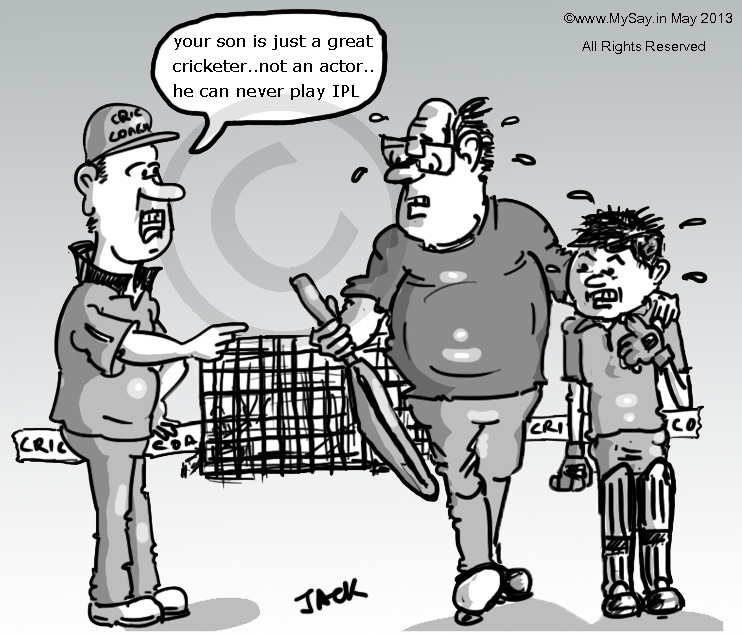 With the introduction of “Glamour” in cricket these things will start to happen for real in future. The advertising world needs lots of so called gods with blind worshipers behind them and these so called gods are supposed to learn acting and dancing skills to look good on screen. Sadly this approach is causing lot of damage to great game of cricket. so true Majaal !! the sport we call cricket is no more gentlemen’s ! such a disgrace but you made it look funny ! good job mysay ! indeed its a disgrace … a game which was once gentlemen’s has gone in the hands of wrong administrators .. Hats of to you….. This is one of the best from you…..
what amazes me is which pen cartoonists use? is any software used to give final touches? hi Avadhoot !! Thanks for the compliment although I am not too sure if I even deserve it . Still !! A very big thank you again. Its the normal sketchboard and the pen from wacom bamboo and any software I get to try my hands on … be it paint.net GIMP phtotshop elements .. whatever comes my way ….flash is the best for cartooning .. i believe ! which pen u cartoonist use? is any software is used to give the final touches ? Sigh. That’s a whole new take on the “All-rounder”! Good one! Aptly portrays the current state of affairs! You have magic in your hands!